The campaign to protect the Chanterelle Forest (SCCF Blk EW28) is not proceeding towards protection based on the scientific evidence we have brought forward. Our local MLA, Nicholas Simons met with Minister of Environment (George Heyman) and Minister of Forests (Doug Donaldson) last Thursday in Victoria, and the outcome was not favorable. The Ministers did not support the deferral of the block to allow time for the new government to consider the Mt Elphinstone Park expansion proposal. We are not 100% sure why, however we feel the need to contact them directly with a clear message of our own. It could be that the Ministers did not fully appreciate that The Chanterelle Forest is a key section of the western boundary of the expanded park, or the urgency in protecting what little remains of our already devastated lower elevation natural forests here. They discussed the lack of a Land Use Plan for our community that would help resolve our current land use disputes, but if that is their solution, it could be a long term process that could come too late to protect the remaining, already tattered integrity of the proposed park. We are asking for a full moratorium on any further logging to the area in the meantime. To add to our concerns, BC Timber Sales is set to open up bidding on yet another cutblock in the centre of the proposed park Jan 2018 – the Clack Creek Forest. A logging moratorium has been enacted before when options for the Stein Valley were being considered. It’s now both a Provincial as well as a tribal park co-managed by BC Parks and Lytton First Nations. 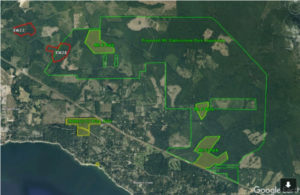 The District of Sechelt’s Mayor and Council could have also deferred the logging of the Chanterelle Forest by the so called Sunshine Coast Community Forest, but have chosen to take a hands off approach. It’s unfortunate as a one year deferral could have bought the time needed to find a balanced solution that actually reflects this community. We are unsure where the current Chief and Council of the shíshálh Nation stands on this issue, they will speak for themselves. Please find below a sample letter to be sent to the Ministers requesting they reconsider a deferral on EW28, and enact a moratorium on any further cutblocks being tendered for logging in the park proposal area, while long term solutions like a Land Use Plan are implemented. SEE the suggested sample pre-written email below… which you can edit (please add name and address) and personalize if you choose. Suggested Sample Letter Content – Vary and personalize if you wish – Then – Copy and paste into your email program and send. Thank you. I was extremely disappointed to hear from our MLA Nicholas Simons, that your offices do not support a 12 month deferral on Community Forest Block EW28 (Chanterelle Forest) on the Sunshine Coast. Logging in this area will wipe out a critical westerly section of an expanded Mt. Elphinstone Provincial Park which is the lower Sunshine Coast’s last and only opportunity to retain a lower elevation native forest large enough to be ecologically significant. EW28 was approved by a now retired Forest District Manager under the Liberal government. We voted for change in the last election, for better public accountability on regional forestry issues. The SCRD supports the park expansion as expressed in OCP Bylaw 641. The Sierra Club, Wilderness Committee and Elphinstone Logging Focus also support its preservation, and the shíshálh First Nations have vowed to protect the portion critical to drinking water within their territory. Consider that this current Sunshine Coast Community Forests tender package includes 3 cutblocks, it’s a small concession to defer one, EW28 for a year to provide your government more time to consider the Elphinstone Park expansion. When we toured Andy MacKinnon (ret. FLNR senior ecologist) through the Chanterelle Forest (EW28) he stated that what we have here is even nicer than Avatar Grove. Please advise us what options you have come up with at this time to address the matter? We understand your conversations with MLA Simons touched on a Land Use Plan as a possible solution, but that could take years, and industry is rushing to cut more of the area before any change takes place. Will a solution be coming quick enough to salvage the lower Sunshine Coast’s last and only opportunity to retain an ecologically significant lower elevation forest? We’ve lost 30% of the proposed Mt Elphinstone Park expansion area already, with another BCTS block (Clack Creek Forest) up for tender in the centre of the proposed park Jan, 2018. By the time we get a LUP, the proposed park could be decimated and it’s already been significantly impacted. We can’t lose more. We understand the importance of forestry to the economy, but we only have 3% of our SC Forest District designated Class A Provincial Park while the rest of the province’s forest districts maintain an average of 15%. We’ve been cheated. Moreover, the additional 1,998ha needed to secure this park only removes .9%, less than one percent, of what BC’s Chief Foresters office says is a harvestable land base of 223,000 in this district. Hardly an industry job killer. We are down to less than 3% of our old growth below 600m in this and most other landscape units in our forest district with unsustainably high cut levels continuing the onslaught. We shouldn’t be asked to give up our last and only chance of a significant lower elevation native forest, especially with tree farms now harvestable in our area. We are already fighting for scraps. I strongly urge you to reconsider your decision and DEFER EW28. We also ask that the Ministers consider placing a MORATORIUM ON FURTHER LOGGING of the park proposal area so that there might be something left worth protecting if a Land Use Plan is to be the final solution. To do this, Wayne McCrory RPBio. suggests a Section 16 Land Act Reserve be established for the proposed park, which temporarily removes it from the Timber Supply Area for 2-3 years while options for land use are discussed with all vested parties. It requires an Order in Council to enact. A similar approach was used in the process that ultimately secured the preservation of the Stein Valley, now a Provincial Park with a Tribal Park layer, jointly managed by the Province and Lytton First Nations. This approach would prevent further public outcry, protests, blockades and arrests that are likely to take place over the continued destruction of this remaining blue-listed forest, and takes in the considerations of the larger community and First Nations. Its time for change.